Reuters Breakingviews predicted 2018 would bring “Froth and Frustration.” And that’s just what investors got as stocks hit new highs during the year before retreating toward bear-market territory as the year came to an end. Though economic tensions between the United States and China dominated headlines, one mega-transaction crystallized the story for Breakingviews’ readers: Broadcom’s failed $117 billion unsolicited takeover of Qualcomm. Another deal, the purchase of the finance and risk arm of Breakingviews’ parent Thomson Reuters by Blackstone, also piqued readers’ interest. Following another U.S. mass shooting, at a Florida high school, stories highlighting ties between the gun lobby and American companies topped most-read lists; as did views analyzing rising populism in Italy and Brazil, which elected new anti-establishment governments, and France. And perhaps it was only fitting given the ructions of the financial markets that stories chronicling the Canadian cannabis boom accounted for five of the 15 most-accessed articles by professional customers on Refinitiv’s Eikon and T1 platforms. Here is a selection of 2018’s most popular columns. China-U.S. tensions – Broadcom’s unsolicited bid for rival mobile-chip maker Qualcomm afforded an unusual corporate-finance window into the growing economic rivalry between the United States and People’s Republic. The deal, which collapsed in March after President Donald Trump signaled opposition on national-security grounds, left Qualcomm’s $44 billion purchase of NXP Semiconductors at the mercy of Chinese regulators. In July, that deal collapsed, too. Cannabis – The boom in shares of companies listed in Canada, where marijuana was legalized in 2018, captivated financial professionals accessing Breakingviews on their Refinitiv Eikon and T1 terminals. Five views on the subject, including one arguing that Constellation Brands’ shareholders had given the booze company no credit for its investment in the sector, ranked among the top 15 most-read pieces on Refinitiv platforms. Guns and money – A day after 17 students and teachers were murdered at a high school in Florida, a column highlighting the ties between Wall Street firms including BlackRock and Lazard and the U.S. firearms industry became one of the most-read articles of the year. It was topped eight months later by an exclusive on FedEx’s decision to end a program that offered discounts for business members of the National Rifle Association. Refinitiv – The sale of a majority stake in Refinitiv, the finance and risk arm of Thomson Reuters, to a consortium led by private equity firm Blackstone allowed Breakingviews to spin out a handful of analytical articles that spurred reader interest. In addition to providing a potential blueprint for the return of large leveraged buyouts with multiple investors, the deal offered one way for Thomson Reuters’ rival Bloomberg, whose founder may run for the U.S. presidency, to reduce his ties to the company bearing his name. Populism – The surprise showing of the League and 5-Star Movement parties in Italy’s March election rattled financial markets, and increased the country’s cost of borrowing as the coalition government sought to expand fiscal spending beyond European Union limits. Similarly, Brazilian elections in October opened a new populist flank, as President Jair Bolsonaro adopted a Trumpian stance on trade and China, which he accused of “buying Brazil.” As 2018 wound down, French President Emmanuel Macron faced a populist insurgency from the “gilets jaunes” movement. Crunchy finance – Other themes that proved popular on Breakingviews ranged from the proliferation of special-purpose acquisition companies, or SPACs, to the evolution of companies focused on plant-based nutrition alternatives to meat. Readers also dug into Trump’s new recipe for the North American Free Trade Agreement. 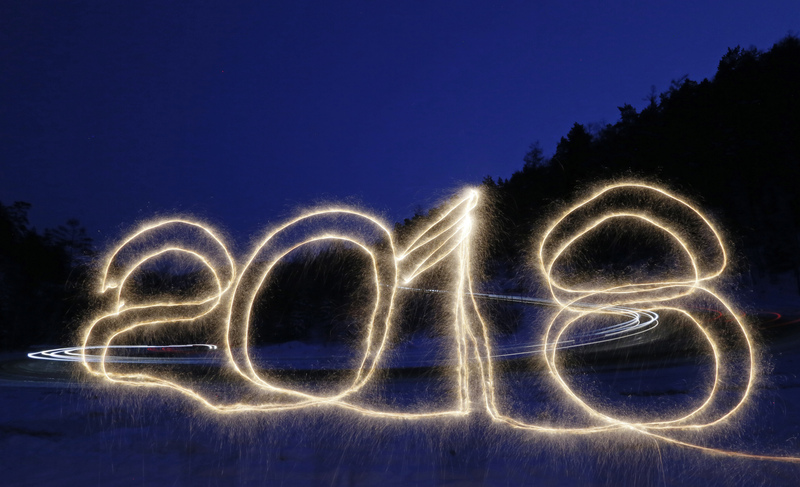 The numbers "2018" are written in the air with a sparkler on a roadside while cars drive along the R257 "Yenisei" federal highway in the Siberian Taiga district outside Krasnoyarsk, Russia January 1, 2018.